I had a terrible vision of America’s future over the weekend. All I did was visit BJ’s Wholesale Club, and there it was. Suddenly solidified proof that America may never be competitive again on the world economic stage. I didn’t need an incorrectly calculated bond rating formula to come to my own downgrade conclusion. The good news for the recently financially-troubled BJ’s is that the place was reasonably full. Shelves were stocked with incredibly large containers of, in no particular order, cayenne pepper (9 ounces, $4), canned clams (51 ounces, $16) and toilet paper (36 rolls, $22). All great bargains. The bad news for BJ’s and all the rest of us is that at least 50% of the patrons were wearing flip-flops. America is doomed. If you’re thinking “what’s the big deal, I wear flip-flops all the time?”, you’re slowing America down. Flip-flops are the footwear choice of lazy Americans. If not lazy Americans, then flip-flops are the footwear of choice for Americans when they feel like being lazy. For instance, I will wear a pair of flip flops when I’m home, grillin’ with the Jimmy Buffet playing on my patio speakers and a cool beer in my hand. But I don’t think that one should drive to the BJ’s and shop for copious quantities of pantry staples and toiletries, while wearing flip-flops. In the case of my trip on Sunday, the store was full. Aisles were crowded and everbody, especially those in flip-flops, moved in slow-motion. It made me realize that if there were an emergency situation, and I was behind people wearing flip-flops, I may be in danger. Think about it…they’re difficult to run in. You have to, kind-of, drag your feet, not lifting your knees. Can’t make long, fast strides. They make a rhythmic, almost hypnotic, schaaa-lap…….schaaa-lap-lazy sound when you walk. Symbolically, any footwear that prohibits running, makes you slower. And “slow” was as abundant as the toilet paper. Unfortunately, we need more “fast” for the sake of our economy. 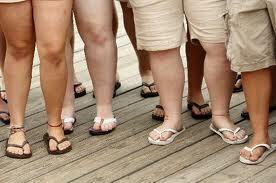 I won’t mention the general weight condition I observed among the people wearing flip-flops. I did not conduct any sort of formal survey, but it did appear that running is not a familiar activity to most of the people wearing flip-flops. If the old adage is true, that the clothes make the man (or woman), flip-flops are not the clothing to wear when dressing to impress. While I have to admit that the variety of flip-flop styles has reached incredible levels…a fancy flip-flop is still a flip-flop. My concern for America based on the flip-flop observation reached a crescendo when later in the evening, with my daughter, I watched the movie “Defiance” . Defiance portrays the true story of three Belarus brothers, the Bielski’s, who helped lead 1200 Jews to freedom in the woods of Russia as the Nazis began their move east. Incredible hardships were endured. Food, medicine, shelter, safety were in inhumanely short supply. Not a BJ’s wholesale center in sight. Not a single person wearing flip-flops. I don’t want to over react to this small and likely inconsequential observation I made on Sunday. Our American civilization is not sentenced to doom because of our footwear. It’s summer…people wear flip-flops. And, while our economy is struggling, we’re nowhere close to being chased into the wilderness by fascist reactionary zealots. But are we moving in the right direction? Would we know how to live without SUV’s stuffed with stuff? Could we hurry if we had to? Or are we slowly schaaaa-lap…….schaaa-lap…….schaaa-lapping our way to economic uncompetitiveness? This entry was posted in Economic History Perspsective, Just Kidding and tagged BJ's, competitiveness, Defiance, flip-flop. Bookmark the permalink. 5 Responses to Will We Survive the Flip-Flop Economy? Hey, maybe a barefoot economy? You may be on to something. Ever walk across a hot blacktop parking lot in barefeet? You need to hustle then! Great article, I couldn’t agree with you more. Flip-flops are the footwear choice of lazy Americans but not just Americans, but lazy people in general. I’m shocked at the popularity of flip flops over the past 10 or so years. I’ve never been a very stylish person and prefer to dress as casually as possible for the most part. Part of it is comfort, and part of it is that I find style to be so incredibly materialistic. I have worn less than formal attire to occasions where I should have dressed up, and not dressed up when it simply would have been more “socially acceptable” but that big of deal… However, flip flops really cross a line in so many ways. I can see wearing them like slippers around the house, or going out in the yard. Maybe making a quick run somewhere and back if you’re in a hurry or really tired. It’s true that you really can’t move fast or naturally in them, and that’s why I’ve never bought a single pair. I actually think NO SHOES is better in many ways. Plus, they are terrible for your feet if worn for long periods of time. Maybe you won’t notice it when you’re young, but good luck when you start getting up there a bit. Finally, unless you’re a decent-looking person with decent-looking, reasonably maintained feet, I DON’T WANT TO SEE YOU OR ANYONE ELSE’S NASTY AND/OR DIRTY FEET IN PUBLIC!!! I was never a big fan of sandals either. They do look better in terms of “formality,” but very few people wore them 24/7 until this century. Thanks for reading, Elise. And for commenting. While I generally agree with you, I was more using flip-flops as a metaphor for our society.